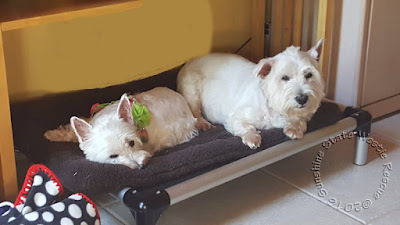 Sophia and Spencer, two senior Westies, had spent their lives since puppy-hood in a stable home with a caring owner. Then, their world was turned upside down. The Westies’ owner had gone on vacation leaving the pups with a responsible pet sitter. 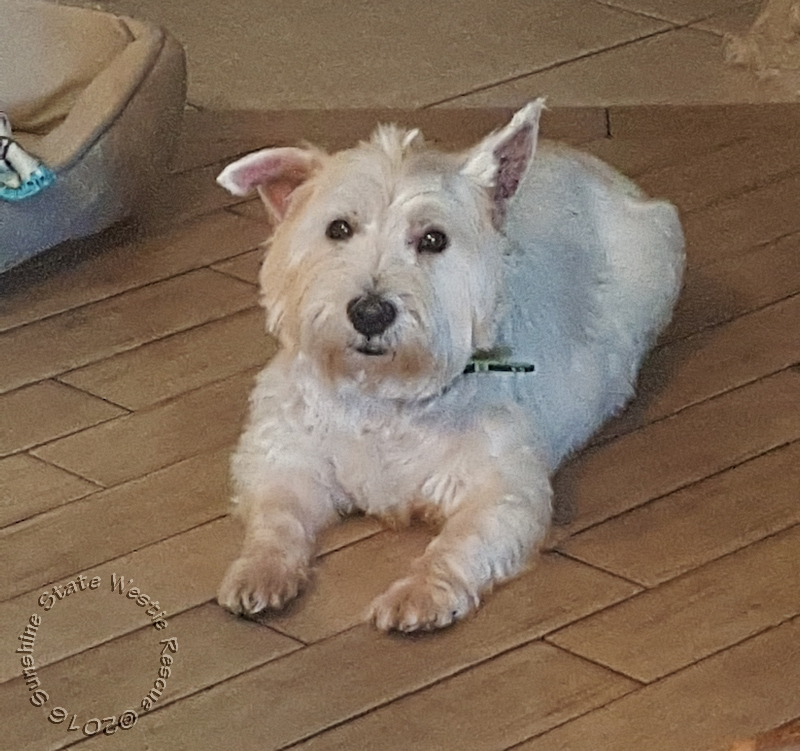 Unfortunately, the owner was killed in a freak accident, and, with no one in the family able to take the Westies, the sitter called Sunshine State Westie Rescue (SSWR) who then took both dogs. The volunteers of SSWR noticed that Sophia, who was ten, had a slow heart rate and something seemed not right. Their vet referred them to a veterinary cardiologist who ran tests and diagnosed Idiopathic Pulmonary Fibrosis or Westie Lung Disease. Since Westie lung disease is not curable and eventually fatal, SSWR hopes to find a long term foster home for both Sophia and Spencer. 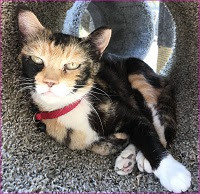 This would mean that Spencer and Sophia are not eligible for adoption and that rescue would continue to financially support their care. Both dogs have been put on medications and have had a first course of cold laser treatments, after which they showed marked improvement. But, both dogs will need additional laser treatments, regular vet monitoring, medications, and some supplements to help them maintain a level of comfort and to control the symptoms of this disease. The cold laser treatments come in a series of ten individual treatments and each series costs just under $300.00. Medications are about $80-$90 per month. The supplement, Serrapeptase, which is recommended for dogs with Westie Lung Disease, is available online. To date, the cost for treating Sophia and Spencer is about $2500. Sophia and Spencer have become, along with eight other dogs in SSWR’s care, sanctuary dogs. They all have a variety of serious health issues and are not adoptable. SSWR will continue to pay for the care of these dogs in foster homes, but, having a significant number of sanctuary dogs with their high maintenance costs, puts a strain on the rescue. Currently, the cost of maintaining these dogs monthly is about $600.00. Additional foster homes and donations for the sanctuary pups are urgently needed. You can find the link to make a sanctuary donation to SSWR or apply to become a foster parent at the end of this article. You will also find a link to a FB group dedicated to Westie Lung Disease. If you would like to volunteer to be a foster parent for SSWR or to make a much needed donation to SSWR for their sanctuary dogs, you may do so through Paypal: Sanctuary Dogs or by mailing a check to: SSWR, PO Box 19415, Sarasota, FL 34276. Check out more animal rescue & therapy animal stories in our Pets section. Want to know how to see your ad like this at the end of an article? Email KRL at life@kingsriverlife[dot]com by replacing the [dot] for more info. 10% of all ad sales goes to animal rescue. Lee Juslin is a free lance copywriter living in North Carolina with her husband, Scott, and her band of misfits: Tarquin, a Wheaten Scottish Terrier, and three handicapped cats. They can be seen on their website: Hampshire Hooligans. She owns I B Dog Gone, a small embroidery business and is the author of the Nurse Frosty books for children and Frosty’s Story: Tales of a Therapy Dog. She supports a number of national and regional terrier rescue organizations.